I was 16 when I started training at my barn for a National show. The girl who was supposed to show for the stable had a huge fight with the owners and left the barn, so it was up to me to ride the horse in Ohio. 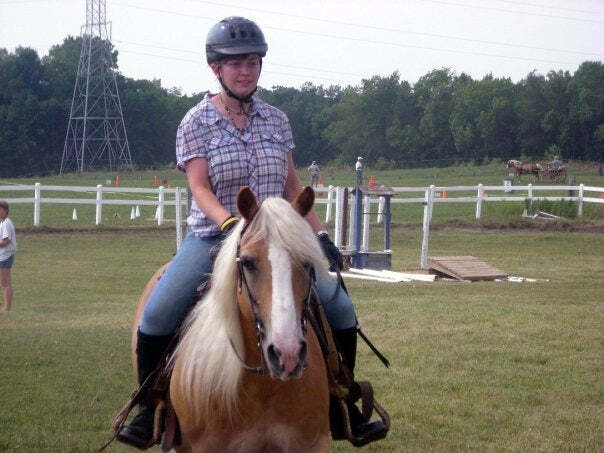 Sting was a 13 year old Haflinger gelding. He is a great school pony and has done everything under the sun. But he can be difficult, especially with novice riders. My instructor was teaching me a jumping course that day. Nothing too high, just about a foot, but since I haven't jumped more than one at a time, it was scary to me. I'm more of a trail rider! Sting was giving me issues about cantering through all the jumps. In between two, he would break into a trot and jump the next. I needed him to canter over them all. My instructor told me to tap him on the shouder with the crop before I went over ther first of the 2 jumps. So, as I lined up, I went to TAP him, and my hand slipped. I whacked him hard. He freaked out, and flew over the first jump. I lost both stirrups, tried to pull him up, but he went over the second. At that point, I was trying to stay on, and then he went straight at the arena fence in front of us. He veered off at the last moment, and I kept going. I don't remember exactly what happened. And that should tell you a lot. I came to to screaming. I thought it was my instructor, but then, she wouldn't do that. Yep, it was me. I was clinging to the fence post screaming my head off, bawling like crazy. Everything hurt. I looked up and saw Sting's belly. He was basically straddling me and keeping my instructor from getting closer. She kept shoving him, trying to move him, but he refused. I stopped screaming long enough to tell him it was okay, and that was all the assurance he needed. He moved to the middle of the arena and watched me with a hanging head. We assessed injuries bit by bit. Move all limbs? Check. Know your name? Check. Can you let go of the post? That one took a while since it felt like my back broke in half. But check. I was finally able to sit up and then stand, but it took close to an hour. I refused to go to the hospital (a decision I wonder about to this day). Overall, my injuries were pretty bad, but could've been worse. I had a concussion, a broken tooth, brusied ribs, bruised (maybe herniated) discs in my back, a broken tailbone, and doctors think I displaced my floating rib (I get sharp, paralyzing pains in my back from time to time and they think its my rib rubbing against another). It took me over a month before I could sit in a soft chair without pain. Once the chaos of the fall wore off, we checked my helmet. Since the whole thing happened so fast, my instructor wasn't sure how I hit the fence. I had a long and big scuff mark on the side of my helmet, but the worst and scariest mark on my helmet was on the back. The foam that comes down the back of the helmet was dented about 1/2 an inch in and was about 3 inches long. It was right where my brainstem is located. If I hadn't been wearing my Troxel, I would have been paralyzed, or even dead. Instead, I went on to show in Nationals, and though the jumping didn't go well, the other classes did and we came out with ribbons. Without my Troxel, I wouldn't be writing this today. I replaced my Troxel with the exact same model and use it every day. It drives me nuts when I see riders without helmets. I've seen way too many bad falls. I don't care how bombproof you think the horse is, or how good of a rider you are, accidents happen, and you'd like to live through it. So, thanks Troxel. Because of you, I can enjoy my own horse now, and go to pharmacy school. I can see my brother graduate, and go on family trips. I can live. And all because I wore a Troxel.